At the risk of alienating certain kinds nerds in an effort to talk to other kinds of nerds, I’ll just say this up front: This post is about Duck Hunt. And to that, I’d simply say that you’re not up to date on your video game news. Now who’s the crazy idiot? 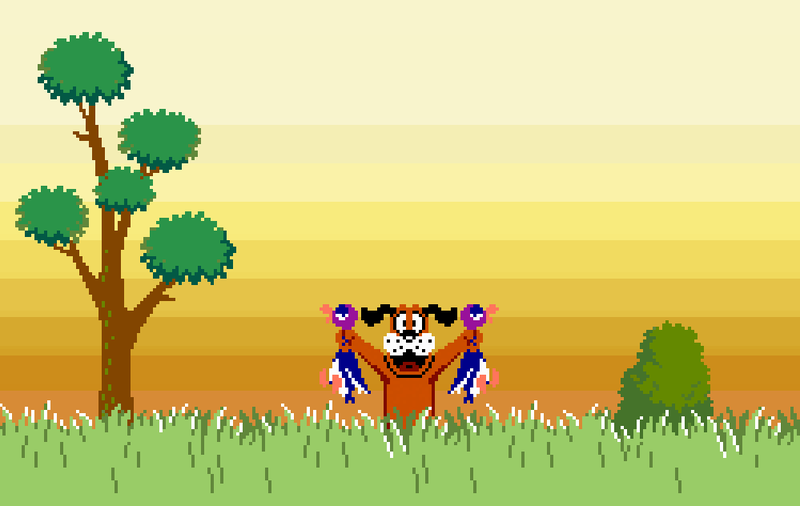 There’s been info floating around online recently about Duck Hunt, and before I go further, I should probably give a Smash Bros.-related spoiler warning. (I guess? Even though the game doesn’t have a plot to speak of?) But it looks like the dog from Duck Hunt will playable in the new Smash Bros. game, meaning that you can play as Mario or Link or Pikachu and then wail on the obnoxious dog who used to laugh at you for not killing enough ducks. Oddly enough, the dog seems to be entering the fray in partnership with one of the ducks, suggesting that past sins have been forgiven. But here’s the odd thing: A few different websites reporting this news point out that the dog is maybe, possibly, sometimes called Mr. Peepers. But for the life of me, I can’t figure out why this would be. I myself noted this in a blog post back in 2009 about how there’s a special arcade version of Duck Hunt that allows you to shoot the dog. (WHO’S LAUGHING NOW, DOG????) But I stupidly neglected to source that information when I posted and am now unsure where I heard it. When I search around online now, I can only find Smash Bros. stuff and other people wondering how the hell anyone decided to start calling the dog Mr. Peepers — on Wikipedia and on GameFAQs. The closest to anything useful I can find is this NeoGAF post. It’s just a simple link to a Nintendo World Report article about the development of the original Kid Icarus, and it only mentions the Duck Hunt dog once — and not by name. But there’s a few responses with people commenting how they were surprised to learn that the dog had a name, so I’d guess that the article edited out that info, for some reason. ‘ In any case, my post on the dog went up before the NeoGAF post and the Nintendo World Report article, but wherever I found the mention of Mr. Peepers is gone too. 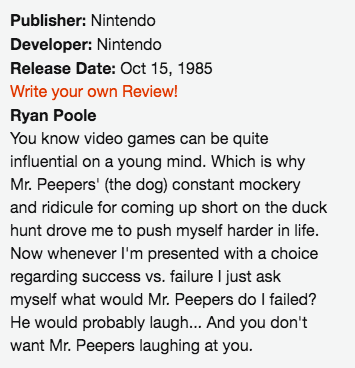 So the question remains: Why the hell does anyone think the dog from Duck Hunt is named Mr. Peepers? It remains to be seen how the dog will be named when Nintendo makes the official announcement about the character. As far as names go, Mr. Peepers at least sounds better that “that damn laughing dog from Duck Hunt,” and certainly better than how he seems to be labeled in the Japanese version of the new Smash Bros. — just as “Duck Hunt.” Maybe it sounds better over there? EDIT February 27, 2015: I just game across this Gamespot article from 2006 that notes the dog’s name as being Mr. Peepers. Can’t say this is where I found it, but at least I know I wasn’t the only one under the impression that this was the dog’s name. Hrm. Well, that's interesting. I wonder where they got their info from. I shall ask. I tried looking stuff up from the Japanese side, but the only reference I found about it was by a guy who wrote a summary about your article (http://www.gpara.com/kaigainews/eanda/2009061801/). I guess that means that it was an American invention. Huh. Is this post telling me I'm an idiot? I can't tell. Oh no, he's just writing about the work that you've done and how impressed he is by it. Nothing mean at all! Oh, and given the above, I have a feeling he'll be called either "Duck Hunt dog" or "Duck Hunt hound" in the North American version of Smash Bros. for 3DS. "Duck Hunt Duo," which I suppose is an elegant a solution as any. This is a possibility, but I honestly would not have invented and then claimed it to be official. Wherever I read the initial info seemed legit. Maybe that initial post was responsible for spreading the idea, but I swear I didn't do it mischievously or even intentionally.